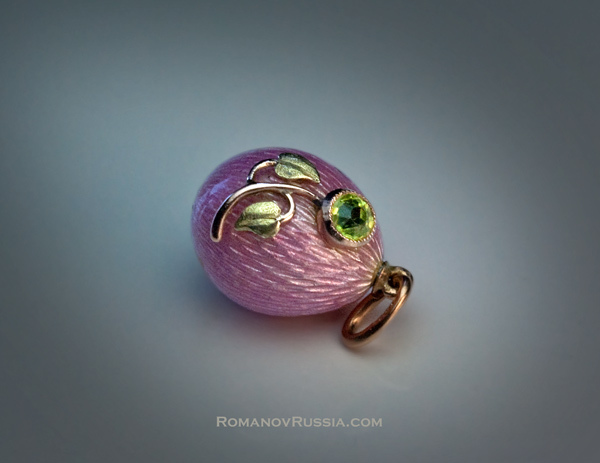 The object for today's Fabergé post is yet another little egg pendant, made by Fabergé's workmaster August Hollming sometime between 1908 and 1913! 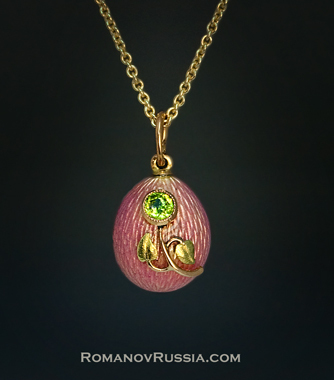 This egg is covered in translucent pink enamel over a guilloché ground. On the front sits an Art Nouveau flower in two-colored gold, set with a sparkling green Uralian demantoid garnet. The stem of the flower is made of rose gold, while the leaves are in matte green gold. The hight of the egg - without the suspension ring - is 9/16 inches (14 millimeter), so it's very small. For 14,000 USD it can be yours, if you follow this link! This is just amazing Miss Meadows, great photos.